THIS IS A SIDE PAGE. You probably think that lanterns are made to provide light, don't you? 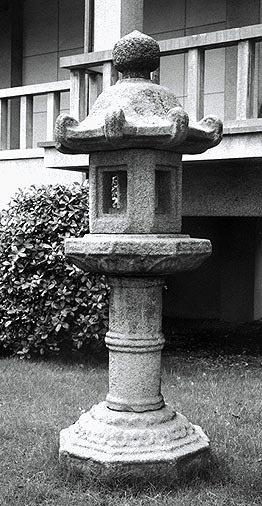 In Japan, however, stone lanterns were not actually used as lamps until the 14th Century, during the Muromachi Period! 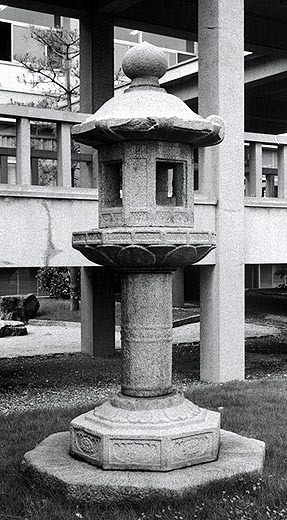 Originally, stone lanterns were placed outside, in front of temples and pagodas. Both temples and pagodas are sacred Buddhist structures that hold precious, holy objects inside. Temples house sculptures and images of the many Buddha, and pagodas hold the sacred bodily remains of the Buddha Shakamuni. Lanterns also held something holy: a sacred flame. This flame was not used for the practical purpose of lighting up these religious structures. In fact, there were no windows in early lanterns from which the light could shine! These old lanterns had a door to light the lamp and a hole to let out the smoke, but there was no opening for the light! Such lanterns resembled wooden cases called zushi, which hold statues of the Buddhas. In a lantern, the Buddha was represented by the flame! Even the pedestal and the base of these early lanterns looked like zushi and were carved with lotus petals, the holy flower of Buddhism. Why do you think these lanterns were treated as such sacred objects? The truth is that in the Buddhist scriptures, or sutras, it says that it is virtuous to offer the light of a lamp to the Buddha. Maybe these lanterns in front of temples and pagodas were meant to be symbolic offerings or memorials to the Buddhas? Lanterns were introduced into Japan as a Buddhist art in the Asuka Period, about 1400 years ago. At the time, many artisans were sent to Japan from Korea's Paekche Dynasty, then under the rule of the Chinese Southern Dynasty. These specialized temple architects and carpenters, shingle makers, painters and other craftspeople brought with them knowledge of the sophisticated culture of China. Imperial Asuka government welcomed these craftspeople and had them build the first temple in Japan, Asuka Temple in Nara. Among the archaeological artifacts excavated from remains of Asuka Temple's main hall was a the foundation stone of a white marble lantern. This shows that Japanese lanterns actually developed from earlier Chinese technology! 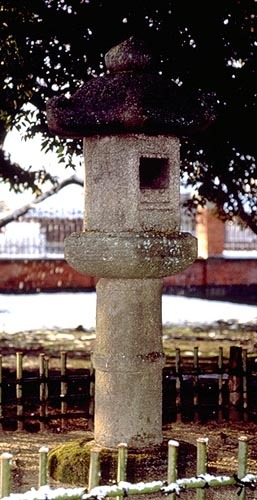 The oldest complete lantern in existence today is the 1300-year-old, Asuka Period lantern in front of Taima-ji Temple in Nara. The second oldest is an 850-year-old (late Heian Period) lantern called Yunoki Toro (Citrus-Tree Lantern), at Kasuga Shrine in Nara.